Isagenix Ingredients - Which Ingredients are in Isagenix Products? 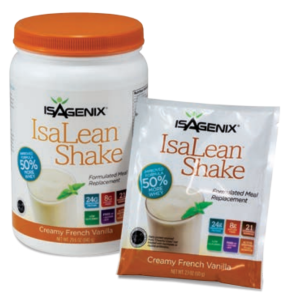 Isagenix’s range of nutritional products includes shakes, cleanses, supplements, snacks, and more. 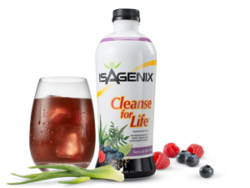 Each Isagenix item is carefully designed using natural ingredients to provide a safe, effective health solution. 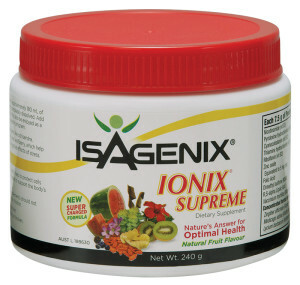 We have provided the ingredient list for several popular Isagenix products. For complete product and ingredient lists, download the Isagenix Nutrition and Supplements Guide. Servings per Container: 14, Serving Size: (2 scoops) 61g. Calories per serving 1,046kJ (250Cal), Protein 24g, Fat, total 6g, saturated 1.5g, Carbohydrate 26g, Sugars 16g, Dietary Fibre, Total 5g, Insoluble 1.1g, Soluble 3.9g, Sodium 200mg, Potassium 350mg, Vitamin A 180mcg, Vitamin C 14mg, Vitamin D100 IU, Mixed Tocopherols 5.215 IU, Thiamin 0.385mg, Riboflavin 0.595mg, Niacin 2.8mg, Vitamin B6 0.63mg, Folic Acid 70mcg, Vitamin B12 1mcg, Biotin 4mcg, Pantothenic Acid 0.65mg, Calcium 200mg, Iron 3mg, Phosphorus 348mg, Iodine 54mcg, Magnesium 80 mg, Zinc 4.2mg Selenium 8 mcg. 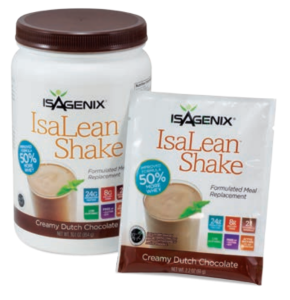 Other Isagenix Ingredients in This Product: Whey Protein (19.7%), Calcium Caseinate, Milk Powder, Fructose, Sunflower Oil, Natural Cocoa Powder, Vanilla Flavour, Lecithin, Olive Oil, Flax Seed, Guar Gum, Tri Calcium Phosphate, Xanthan Gum, Fibersol, Cellulose, Chocolate Flavour, Salt, Beta Carotene, Honey Powder, Magnesium Oxide, Irish Cream, Acidophilus, Alfalfa Juice Concentrate, Soy Lecithin, Lactase, Psyllium Seed, Silicon Dioxide, Cinnamon, Mixed Tocopherols, Vitamin C (Ascorbic Acid), Kelp, Iron Lactate, Zinc Oxide, Wild Yam, Niacin, Selenomethionine, Vitamin D, Vitamin B6, Calcium Pantothenate, Riboflavin, Vitamin B1, Biotin, Vitamin B12, Folic Acid. Contains milk and soy (lecithin) ingredients. Amino Acids Per Serving (naturally occurring in Whey Protein+): Alanine 900mg, Arginine 600mg, Aspartic Acid 1,900mg, Cystine 300mg, Glutamic Acid 4,200mg, Glycine 400mg, Histidine 400mg, Isoleucine 1,100mg, Leucine 2,200mg, Lysine 1,900mg, Methionine 550 mg, Phenylalanine 850mg, Proline 1,800mg, Serine 1,100mg, Threonine 1,200mg, Tryptophan 320mg, Tyrosine 850mg, Valine 1,300mg. + Since amino acids are naturally occurring, amounts may vary. Barley Free, Wheat Free, Gluten Free, No Trans Fat. Servings per Container: 14, Serving Size: 2 (60g) Calories per serving 1004kj (240Cal), Protein 24g, Fat, total 5g,“ saturated 1.5g, Carbohydrate 24g, Sugars 11g, Dietary Fibre, Total 8g, Insoluble 0g, Soluble 8g, Sodium 240mg, Potassium 270mg, Vitamin C 14g, Vitamin D 2.5mcg, Mixed Tocopherols 3.49mg, Niacinamide 2.8g, Thiamin 0.385mg, Riboflavin 0.595mg, Vitamin B6 0.63mg, Vitamin A 187.5mcg, Folic Acid 70mcg, Vitamin B12 1mcg, Biotin 4mcg, Pantothenic Acid0.65mg, Calcium 200mg, Iron 3mg, Phosphrus 348mg, Iodine 54mcg, Magnesium 80mg, Zinc 4.2mg, Selenium 8mcg. Other Isagenix Ingredients in This Product: Exclusive Myo-IsaLean Complex (55.6%) (whey protein concentrate, milk protein concentrate, low-heat nonfat milk), isomaltooligosaccharides, fructose, sunflower oil, natural flavours, olive oil, flax seed powder, maltodextrin (tapioca), thickener (415), calcium phosphate- tribasic, medium chain triglycerides oil powder (427a), cinnamon powder, magnesium oxide, apple juice powder, enzymes (lactase, cellulast, intertase, lipase) alfalfa leaf, sea salt, magnesium stearate (470), silicon dioxide (551), psyllium seed powder, mixed tocopherols concentrate, vitamin C (ascorbic acid), ferrous lactate, iodine (from kelp), natural sweetner (960), niacinamide, zinc oxide, wild yam, pyridoxine, riboflavin, thiaminemononitrate, selenomethionine, Lactobacillus acidphilus, cholecalciferol, bertacarotene, calcium pathothenate, biotin, cyanocobalamin, folic acid. Amino Acids Per Serving: Alanine 980mg, Arginine 655mg, Aspartic Acid 2,110mg, Cysteine 470mg, Glutamic Acid 4,130mg, Glycine 425mg, Histidine 470mg, Isoleucine 1,365mg, Leucine 2,270mg, Lysine 1,880mg, Methionine 550mg, Phenylalanine 845mg, Proline 1,635mg, Serine 1,155mg, Threonine 1,340mg, Tryptophan 435mg, Tyrosine 880mg, Valine 1,360mg. Barley Free, Wheat Free, Gluten Free, No Trans Fat. Ingredients: Vitamin B1 (thiamine hydrochloride) 4mg, Vitamin B2 (riboflavin) 7mg, Vitamin B6 (pyrodoxine hydrocholoride) 8mg, Vitamin B12 50mcg, Vitamin B3 (Niacin) 11mg, Zinc 8mg, Black strap molasses 8000mg, Sorrel flower 200mg, Ionic tri-mineral complex (calcium, phosphorus, potassium) 168mg, Stevia 22mg, Alpha lipoic acid 20mg, Tribula terrestris 10mg, Sibrian ginseng 10mg, Schizandra 10mg, Wolfberry 10mg, Mucuna pruriens 6mg, Rhododendron caucasicum 5mg. Also includes: Citric acid, Betaine hydrochloride, Water, Potassium sorbate, Sodium benzoate, Blueberry leaf, Blueberry juice, Bamboo, Bacopa, Ashwaganda, Amla berry, Ginger, Hibiscus, Kiwi fruit, Watermelon fruit, Shilajit, Harada, Maca, Rhodiola rosea, folic acid. Ingredients: Nicotinamide (vit B3) 13mg, Pyridoxine hydrochloride (vit B6) 1.2mg. Cyanocobalamin (vit B12) 6.75mcg, Thiamine hydrochloride (vit B1) 1.1mg, Riboflavin (vit B2) 1mg, Zinc oxide 6.2mg, Equivalent to 5mg zinc, Folic Acid 250mcg, Dimethyl sulfone (MSM) 20mg, R,S-alpha Lipoic Acid 25mg, Vaccinium myrtillus (Bilberry) fresh fruit juice 200mg. Concentrated herbal extract equivalent to dry: Zingber officinale (Ginger) root 20mg, Medicago sativa (Alfalfa) leaf 500mg, Lycium barbarum (Wolfberry) fruit 400mg, Hibiscus sabdariffa (Hibiscus) flower 200mg, Withania somnifera (Ashwagandha) root 120mg, Citrullus vulgaris (Watermelon) fruit juice 140mg, Rhododendron aureum (Rhododendron) Leaf 125mg, Terminalia chebula (Harada) fruit 150mg, Rhodiola rosea (Rhodiola) root 120mg, Eleutherococcus senticoses (Siberian Ginseng) root 100mg, Phyllanthus emblica (Amla) fruit 125mg, Bacopa monnieri (Bacopa) herb 125mg, Tribulus terrestris (Tribulus) fruit 80mg, Bambusa breviflora (Bamboo) stem 375mg, Schisandra chinensis (Schizandra) fruit 60mg, Arctium lappa (Burdock) root 200mg. Warning: Contains sugars. Vitamin supplements should not replace a balanced diet. Not suitable for children. What is Significant About Isagenix Ingredients? Isagenix was founded in 2002 by the ‘Mineral Man’ John Anderson. With extensive experience in supplement development and ingredient research, Anderson knows that effective health products must be made from the best natural ingredients. Anderson oversaw the creation of the majority of Isagenix products, drawing on his background in Eastern medicine, rare minerals, and superfoods. To create the most effective products as possible for customers, Isagenix’s research and development team invests significant time and resources into finding the perfect quantities of ingredients for each formula. Isagenix is devoted to providing everything that the customer needs and nothing that they don’t need; you can have confidence that your Isagenix product will not include any unhealthy or dangerous ingredients. Unlike other health companies that compromise on the integrity of their ingredients, Isagenix only relies on the highest quality elements for their products. Isagenix ingredients are all natural, free from the growth hormones and chemicals that often result in unintended side effects. Isagenix is noteworthy for its ‘No Compromise Ingredient Policy’, which guarantees that every ingredient in an Isagenix product will be ‘Healthy, Safe, and Transformative’. How Does Isagenix Research its Ingredients? Research and selection: Isagenix’s team of over 35 respected scientists researches ingredients and dosages from around the world for use in products. Raw materials are chosen to be collected and inspected. Identification of suppliers: Once materials have been chosen, Isagenix identifies suppliers that can provide sustainable, fresh ingredients that meet company standards for efficiency. Audits of manufacturers: Isagenix uses extensive third-party auditors to ensure that manufacturers meet quality and safety standards. International guidelines: Using guidelines provided by the FDA and other international advisory boards, Isagenix makes sure that each ingredient is safe and free of harmful impurities or toxins. Quarantine and testing: Before use, each ingredient is quarantined and tested extensively for purity, strength, and organoleptic properties like taste, texture, and colour. Commercial production: Once approved in testing, the ingredients are sent into commercial production. Quality assurance and compliance: Like before production, finished products are tested extensively to ensure high quality and compliance with international guidelines and regulations. Independent testing evaluates the product to confirm that the ingredients are accurately reflected in the product listing. The products are also tested to ensure that they will be stable throughout their listed shelf life. Distribution: Once approved, Isagenix products are distributed to customers around the world.